The extractive industry especially oil and gas has the potential to transform the East African region a prosperous economy but it also creates risks and challenges for any economy especially when dealing with human rights . The trend of the oil and gas industry in Africa has been thorny; management, extraction and money derived from its sale has been linked to grave human rights abuses by states and companies. In response the international community has sought mechanisms to mitigate the power, and potential negative influence, businesses have over human rights. The new resource rich East Africa is not immune from the dangers associated with the oil and gas industry. There are numerous cases of the infamous “resource curse syndrome” and the so-called “Dutch disease”in sub Saharan Africa. An alarming number of human rights abuses related to fossil fuel operations have been perpetrated by governments and corporations around the world. These include, for example, forced relocation and deadly suppression of critic’s .The most notorious and high profile examples of gross human rights abuses come from Nigeria, where Ken Saro-Wiwa and eight other men paid the price of oil in 1995 with their lives. The men were hanged in Nigeria’s Port Harcourt prison after launching a non-violent movement for social and ecological justice for the Ogoni people in the Niger Delta, challenging the conduct of the oil companies and the Nigerian Government. 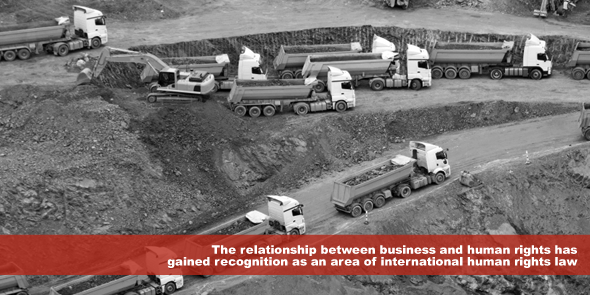 The relationship between business and human rights has gained recognition as an area of international human rights law. In June 2008 the special representative of the United Nations Secretary General for Business and Human rights Professor John Ruggie developed the UN “Protect, Respect and Remedy” policy framework for addressing the business and human rights governance gaps that have arisen with the rise of globalization. The Framework is based on three pillars: the state duty to protect against human rights abuses by third parties, including businesses; the corporate responsibility to respect human rights, which means to avoid infringing on the rights of others and addressing negative impacts with which a business is involved; and the need for greater access to effective remedies, both judicial and non-judicial. In East Africa, Kenya has moved a step forward in adopting the UN Guiding Principles on Business and Human Rights by initiating The ‘Nairobi Process: A Pact for Responsible Business’. This is a new initiative being developed by the Institute for Human Rights and Business (IHRB) in collaboration with the Kenya National Commission on Human Rights which aims to embed human rights due diligence through the application of the UN Guiding Principles on Business and Human Rights in the emerging oil and gas sector in Kenya. In Uganda there is currently no policy or national law that reflects the United Nations Guiding Principles on Business and Human Rights though civil society organizations including ActionAid International Uganda have published a number of reports that recommend that Uganda adopt the United Nations Guiding Principles on Business and Human Rights in a National Action Plan on Business and Human Rights. They recommend that the National Action Plan should be developed based on a multi-stakeholder consultation encompassing civil society, business and state regulatory/ implementing institutions to ensure the views of all stakeholders are taken into account. Despite these recommendations, no progress has been made towards adopting the United Nations Guiding Principles on Business and Human Rights in a National Action Plan in Uganda, which is worrying because Uganda is on the verge of commences oil production in commercial quantities. This would therefore have been the perfect time to take proactive measures to set the relevant standards for regulating corporate human rights responsibility in the oil and gas sector. The East Africa region needs to recognize that the discussion on business and human rights is not only morally correct but also a step towards having a thriving extractives industry that respects, promotes and protects human rights and take initiatives in advancing the UN Business and Human Rights guidelines. The need for states to adopt and implement the UN Business and Human Rights guidelines may be the best option for states to impose obligations on non-state entities for human rights compliance to ensure that their citizens receive the most benefits and are not adversely impacted by the activities of companies in the extractive sector. About the Author: Matsiko Samuel is human right lawyer and currently an African Excellence DAAD Scholar at the South-African German Centre for Transitional Justice. He previously worked with the International Justice Mission a human rights organisation. He has a keen interest in international criminal justice, business human rights and African human rights system. thanks a lot Samuel for your essential article reminds us as African in general how rising our problems affect our life, healthy even our economy. our role as human rights lawyers or activists is to protect our people rights, to life in peace, safe and healthy. its important that our countries go to be developed as other development countries as U.S.A . UK but we need such development must be with beneficiary of our people. our role in this regard do our best to rise any problem if there and reminding official authorities to fix such problem if it affects environmental, human rights through all available ways. the big issue we faced through our historical background is our leaders whether official or private sector most of them are corrupted and self fishes, they just work for their interests. so we need extreme work our countries to be free from such illnesses, if that possible we may make net work link with group mobilization work through exchange information to fit human rights in our continent. your article is a wake up call to leaders in the region that respect of human rights does not conflict with development initiatives. it is an important addition, if not a condition.